A majority of legislators in the National Assembly approved the mission put forward by socialist dictator Daniel Ortega, a move reportedly in response to the growing social and political crisis unfolding in the Central American country. “Today we approved a decree of urgency sent by the highest authority of our country, President Daniel Ortega, in this approval is present a plan made by the Army of Nicaragua about exchanges for training and humanitarian purposes,” said the first secretary of the Board of Directors of the Nicaragua, Gloria Dixon, in a statement Wednesday. It is not immediately clear what the role of various militaries will be in Nicaragua, nor is it clear whether the U.S. and Taiwanese troops may have to work alongside soldiers loyal to the regimes in Cuba, Venezuela, and Bolivia who consider themselves vehemently anti-“imperialist”. 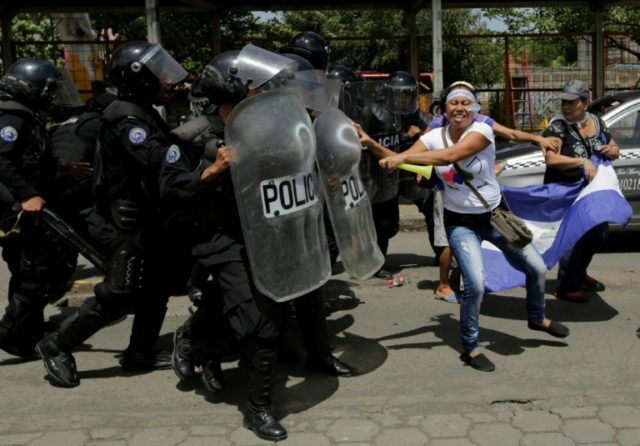 A crisis broke out in Nicaragua in April this year after government security forces reacted violently to peaceful demonstrations that initially started as protests against proposals to change the country’s social security system, but eventually became a nationwide movement calling on Ortega to step down. Since their outbreak, the government’s response to protests has become increasingly brutal, killing an estimated 300 people in police attacks and wounding over 2,000 more. The government has also arrested thousands of anti-Ortega dissidents, with some reports claiming prisoners are being raped, beaten, and tortured in attempts to coerce them into admitting they work for the United States and the CIA. Although not as serious as Venezuela, the scale of Nicaragua’s humanitarian crisis has been the subject of international attention over recent months, as thousands of people attempt to flee the country, the majority of whom are arriving in neighboring Costa Rica. So far, Washington has responded to the violence by sanctioning three top Nicaraguan security officials for alleged human rights abuses and corruption. Speaking at the Freedom Tower in Miami this month, President Donald Trump’s National Security Adviser John Bolton confirmed that broader sanctions on the regime were “coming in the very near future,” while condemning the “three stooges of socialism” of Nicaragua, Venezuela, and Cuba.